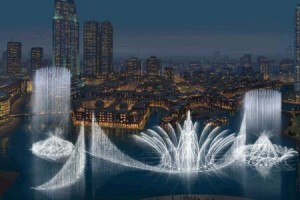 Water Fountain in Dubai Mall. You need to check that out in the evening. You can see the view very clearly all around this huge pool. You don’t need to rush to find a strategic spot to view this fantastic water display. 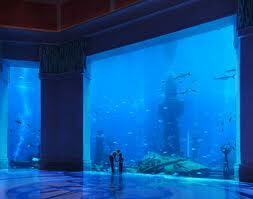 Other attractions are the Lost Chambers with over 20 marine exhibits. Walk through the Lost Chambers with over 20 fresh and seawater marine exhibits including sharks, stink rays, piranha, giant arapaima, giant grouper, lionfish and much more. Entrance fees: adult AED100 children AED70. 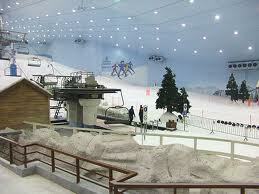 Indoor snow ski resort, the first ski resort in the Middle East. Amazing mountain theme snowed setting to enjoy skiing, snowboarding and tobogganing or just having fun in the snow park. 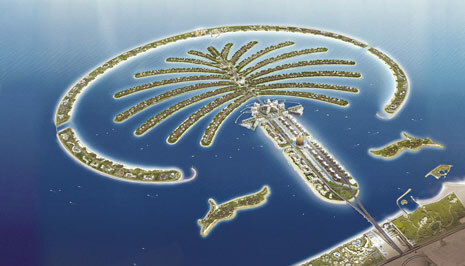 Dubai Aquarium and Underwater Zoo are at Dubai Mall, where the tallest building is situated. 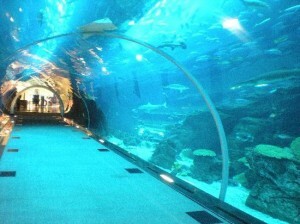 The aquarium is similar to the ones in Atlantis but this one has walk under water through a 48 m long tunnel, experience what it is like to be 11 meters below ocean surface. In my personal opinion, I decided not to use use Oasis Palm Tour. They seem to be the largest tour outfitter there, at least for this tour. There were about 20-30 4x4s all in a big convoy bashing around the desert. At each of the 'activity' stops, you are competing with all these other people on the tour for a ride on the sand board or camel, or for the food. Use a less advertised outfitter and make sure that they are not going to lump you in with 50 other people. If you've never been to the desert, you're better off going to the real thing - like Namibia or Egypt. 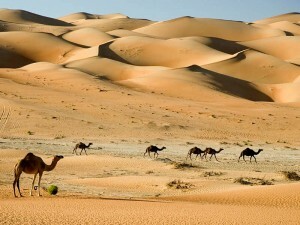 Maybe even to an oasis in Oman (Al-Ain), though I didn't make it there myself. 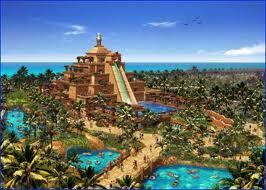 If you're easily entertained, go for it, but otherwise, just skip it and enjoy the pool at your hotel.